Too often, the desire for new technology is stalled by “sticker shock” or the inability to make the case for investment. Cloud solutions reduce the sting of upfront costs, but monthly license fees raise eyebrows when the calculation of total cost of ownership stretches out over five years or more. My aim in this month’s column and the next is to arm you with new ways of thinking that can build momentum for your technology pursuit. 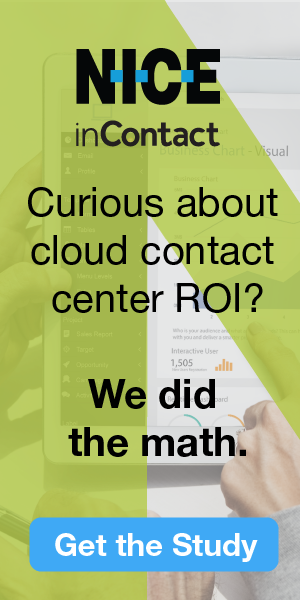 We will break down the cost of contact center operations (this month), and then show you where the Return on Investment (ROI) can be found to make the right technology investments for your center (next month). A side benefit is that by better understanding costs and benefits, you will see how technology helps to make the case for the right number of frontline and support staff. Centers all bear the same types of costs to conduct their operations, whether they’re attributed to the contact center budget or to that of IT or other parts of the organization. So, analysis of contact center cost structures should consider the main elements that contribute to the company’s budget, not just the center’s budget. Costs include fixed and variable costs: the former being ones that are not specifically tied to business drivers, and the latter being costs that vary with the workload those drivers create. You also need to consider one-time versus recurring costs. Good examples of one-time costs associated with an employee are the cost of hiring or the cost of new-hire training. Of course, the recurring costs include their salary and benefits. A good understanding of these costs sets the stage for looking at cost savings and other benefits. I’m going to share some insights on contact center cost structures from our modeling, but you will want to model your own specific costs across these elements. Frontline labor—including agents, team leads, and supervisors—is by far the largest contact center expense, accounting for roughly two-thirds to three-fourths of the overall operating cost. It also presents the greatest opportunity for cost management or reduction. A well-constructed model provides keen insights on this variable expense based on volumes and handle times, as well as factors that impact efficiency in the use of these valuable resources, such as occupancy and shrinkage. Frontline labor costs also vary by location, presenting a great argument for locating in places with “reasonable” cost of living and associated pay levels. For example, when we’ve helped clients with site selection, we’ve seen the mean wage for similar contact center jobs range from $13-$17 per hour. Centers also need to consider labor pool size and local competition for contact center jobs to ensure they can secure enough qualified staff at the prevailing market wages. Leadership and support resources are another important labor cost that can vary with size but ties less directly to workload. Every center needs a manager (or director or VP or whatever title they bear), and bigger centers may need another layer. Ideally, every center has some analyst support for things like reporting, workforce planning, quality monitoring, process optimization, knowledge management and projects. Sometimes analyst numbers—like WFM and QM—grow with the number of agents, but there are economies of scale and high variability based on many factors (e.g., hours of operations/number of shifts, span of control and supervisor roles, etc.). Hourly rates or salaries are not the only factors in labor costs. “Loading” factors for benefits such as health insurance, life insurance, 401k, and taxes (Social Security and Medicare, as well as unemployment and other local taxes) add up quickly. We typically use 30% in our models. Incentives and bonuses can also be a part of the labor cost, depending on how they are structured. A formulaic sales bonus looks different than gift cards or a premier parking spot for a month. 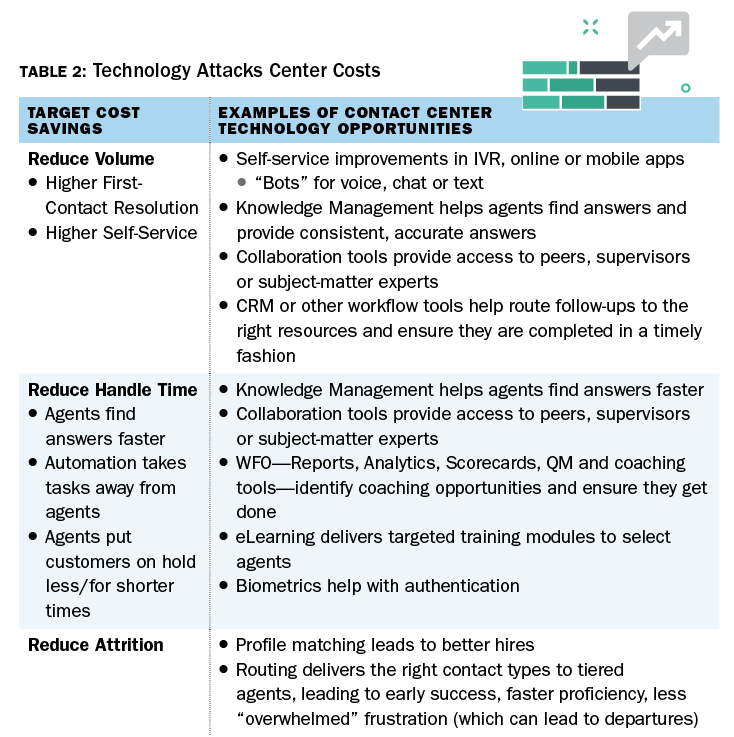 It’s important to look at total costs for each contact center technology element. For traditional premise-based solutions, maintenance costs (e.g., 18%-22% of the cost of the solution per year) are added on top of the purchase price. For cloud-based solutions or network services, cost is based on usage (e.g., a monthly license fee or a per-minute cost). Implementation costs can be waived or relatively small (more likely with cloud solutions) or can be extensive when they include professional services for installation, design, configuration or development, integration, testing and cutover support. Core contact center technology is the big factor specific to contact center operations, and includes things like the ACD that routes and reports on (omnichannel) contact handling, IVR for self-service and WFO solutions (QM, WFM, analytics, etc.). The costs of all these tools can vary tremendously based on size and sophistication of the center. Network considerations include voice and data. Data networks are typically enterprise networks—Wide Area Network (WAN) and Local Area Network (LAN)—that are provided for all users, with the associated capacity, features, security, etc. Most of this is an IT responsibility that the contact center has no accountability for: it’s a cost the company will bear no matter where the work gets done. Contact center-specific network costs traditionally include some dedicated networks for voice, toll-free numbers (with per-minute costs), and in some cases, network services for rerouting or percent allocation, for example. Some companies are using internet services for both voice and data, especially for those moving to cloud solutions. Other systems, applications and infrastructure, such as the desktop PC, monitor and phone, are considered base IT costs. Similarly, applications not specific to the contact center—from the office applications suite to ERP to CRM to core systems for customer records, orders, billing, etc.—are baseline IT costs. These are very unlikely to be a contact center budget line item. They are incurred for the staff to do this work wherever they reside, so we do not typically include them in our modeling (and have excluded these costs from the models used for this article). While the remaining line items may seem small, they can add up and can be heavily impacted by factors such as location and attrition. Facilities costs include rent, utilities and taxes. These factors can be modeled based on the number of staff (a variable cost) when budgeting and planning, but are often fixed if using an existing building. Regardless, they are like labor costs in making it clear why companies don’t want to locate in high-cost places as cost per square foot can vary significantly. Think of a “good” contact center location being something like $1/square foot/month but know that in a “hot” location, it could be two to five times that much. Other overhead costs can include rewards and recognition, with each center having some budget for pizza parties, decorations or other special activities that don’t fit into payroll. Hiring and training costs can be non-trivial if attrition is high. We typically use $2,000 per agent for each in modeling. Other miscellaneous costs can include travel and training for leadership (e.g., conferences), or other development costs. The key tradeoff is the cost of frontline labor versus technology. We varied technology costs 4%-12%, ranging frontline labor across 68%-77% of the operating cost. Technology costs may go up (overall and as percent of contact center operations costs) as more sophisticated technology is put into place. We can’t write about anything in the contact center world these days without mentioning artificial intelligence—bots, desktop tools, etc., that could transform the center. They won’t eliminate the need for agents—but they can make a dent. However, the labor remains the big cost, and the biggest slice of the pie (see Figure 1). Armed with a detailed cost model that captures the baseline state of the contact center, managers can begin to assess the bottom line impact of new technologies under consideration and quantify the impact that it will have on labor and on overall costs. 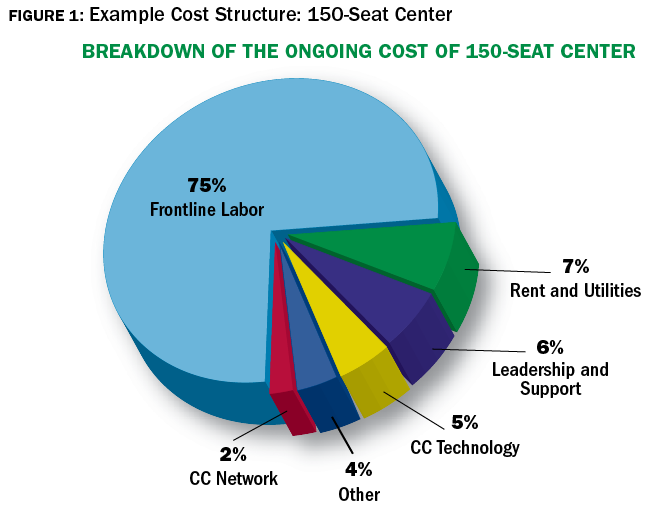 Our example models of small (50 seats), medium (150 seats) and large (300 seats) centers show cost per contact around $3.21-$3.35 for an average talk time of three minutes, with 30 seconds of wrap-up time. 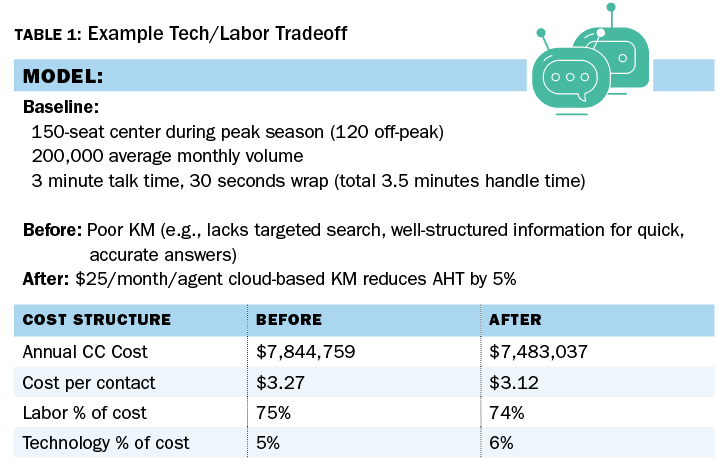 From the baseline cost, I ran an example of a $25/month/agent investment in a cloud-based Knowledge Management tool that could reduce handle times by 5% (or more). That direct impact on the labor demands to handle the same volume shows the power of technology: the per-contact cost in my mid-size center example drops from $3.27 to $3.12 as the agent demands go down by six agents. That translates to an annual savings of about $362,000 (see Table 1). And I haven’t yet considered the volume reduction if FCR goes up as well! Getting a full understanding of your costs and cost structure is the first step in managing contact center costs. Next month’s article will dig deeper into the hard and soft benefits that technology can deliver to showcase a true ROI. Table 2 provides a starter sampling of cost impacts technology can deliver to whet your appetite. Meet me here next month to learn more! What’s the Cost to Build Out a New Center? Sometimes companies want to assess what it will cost to build out a new center—for example, when considering moving an outsourced operation in-house, or growing significantly. Modeling the costs for hiring and training staff, purchasing and implementing contact center-specific technology, and building out a facility, the costs for a new center can easily run $10k-$15k/staff member or more. Add on top of that the ongoing operational costs, and any costs for staff or other resources not specific to the contact center and the seats being implemented there (like IT, HR, etc. ), and you can see a new center is not a trivial undertaking!